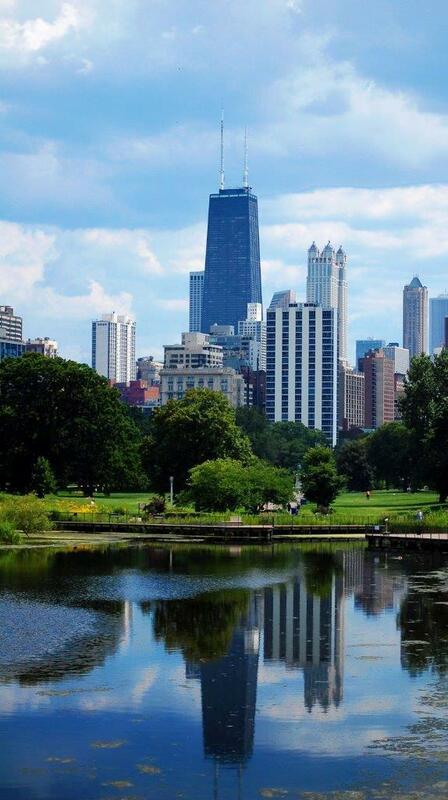 ​Home to the 2016 World Series champions and the deep dish pizza, ‘Windy City’ Chicago is one of the most important business centers on the planet. It has been an international hub for transportation and commerce since the 1800s. Established as a city in 1837, it quickly turned into an industrial capital with the creation of the Illinois and Michigan canal in 1848 and the completion of a railroad network soon after that. Its architectural growth was equally as important; the city was home to the world’s first skyscraper, a ten-story home insurance building completed in 1885 and it has long been a center for architectural innovation. 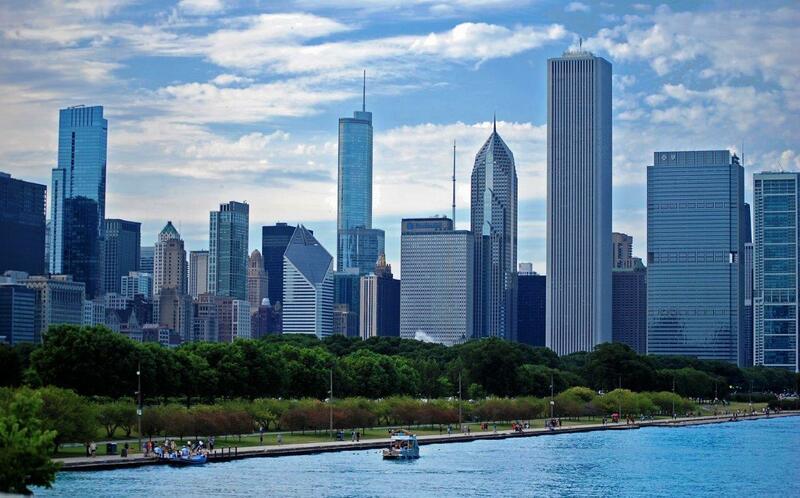 With 2.7 million residents in the city itself, and almost 10 million in its metropolitan area Chicago, located along the Lake Michigan shore, is the third largest city in the United States. It’s also the birthplace of Walt Disney, house music and the famous Chicago Blues. Kingston Mines, the world-famous blues venue, located in Lincoln Park, is a ‘must see’ location. If your music cravings are still not satisfied, stop at the Green Mill in Uptown, the oldest jazz club in the United States and gangster Al Capone’s main hangout back in the 1930s. 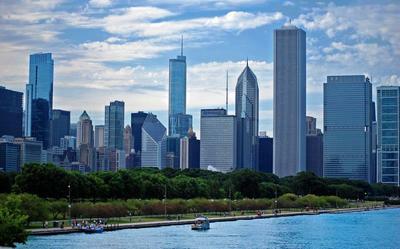 ​Downtown Chicago offers a variety of activities that will keep you busy the entire day. 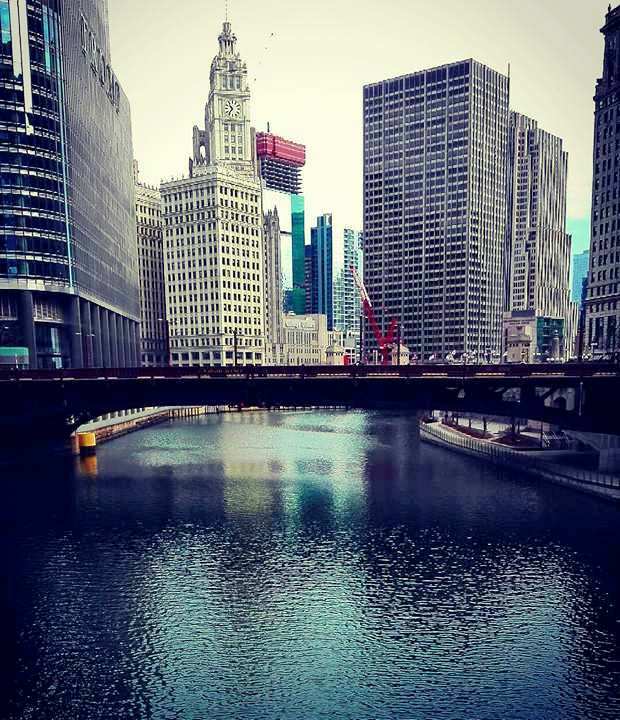 To learn about the history and architecture, take the Architecture River Cruise, offered by the Chicago Architecture Foundation. It will take you on Lake Michigan and along the river for an all-inclusive skyscraper viewing tour. 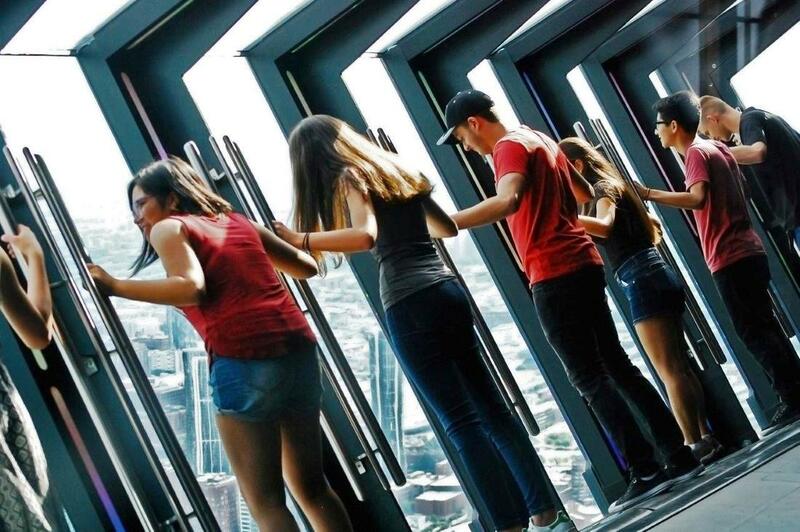 After that, stop at the John Hancock Center and go up a 1000 feet to get a 360 degree view of the city. The observation deck also offers the ‘Tilt’ attraction, a platform that will tilt you out from the 94th floor. From the John Hancock Center, walk along the ‘Magnificent Mile’, an upscale shopping avenue full of landmarks until you reach Millennium Park and Grant Park. These parks are home to the famous Cloud Gate (‘Bean’) but also to the Jay Pritzker Pavilion, the Art Institute of Chicago and the Buckingham Fountain. During the summer many events take place in the park, such as movie screenings and concerts by the Chicago Symphony Orchestra. Chicago has five professional team sports, which includes the Chicago Bulls (basketball), the Chicago Bears (football), the Chicago Fire (soccer), the Chicago Blackhawks (ice hockey), the Chicago White Sox and the Chicago Cubs (baseball). The Cubs won the 2016 World Series Championship and you can catch one of their games alongside thousands of proud Cubs fans at the Wrigley Field. 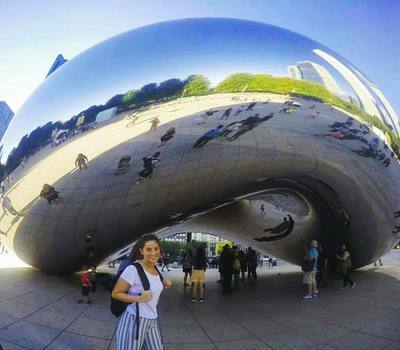 Chicagoans are also very proud of their stand-up comedy scene, and the city hosts various comedy clubs that include improvisation, stand-up comedy, open mic, sketch, theater and more. Many famous comedians such as Steve Carell, Jim Belushi, Stephen Colbert and Bill Murray made their debuts at the Second City, which is located in Old Town. Not only is Chicago a global culinary headquarter, it is also famous for its legendary deep-dish pizza and Chicago-style hotdog. Pizzeria Uno is not only the place best place for deep-dish pizza (characterized by a very deep crust, resembling a pie), it apparently also originated there. The typical Chicago hotdog, topped with onions, tomato slices, green relish, yellow mustard, pickled peppers and a dill pickle, can be found at Portillos in River North, in the same neighborhood as Pizzeria Uno. Thirsty after all that Chicago fare? The city has a great tradition of brewing and hosts a number of brewpubs and microbreweries. The largest brewer of the region is Goose Island Brewery, with a brewpub located on Clybourn Avenue. The company produces a large number of beers that are available all year long, as well as some seasonal beers. If you’re looking for somewhere to rest your head, the Palmer House Hilton has been an architectural jewel since it first opened in 1871. With its extraordinary ceilings and majestic chandeliers, this hotel has long been a part of the National Trust for Historic Preservation. Located in downtown Chicago, the hotel is close to trains, busses and most of the city’s touristic attractions. Planning a visit? Chicago winters are harsh, reaching temperatures of -30F. The best time to visit is therefore in the summer, between the months of May and September, when most attractions are open. The best way to get around is to take the Chicago Transit Authority (‘CTA’) bus or train. Public transportation is extremely well developed in the city, connecting downtown to both airports. Fares are relatively cheap and the trains are easy to identify (by color). 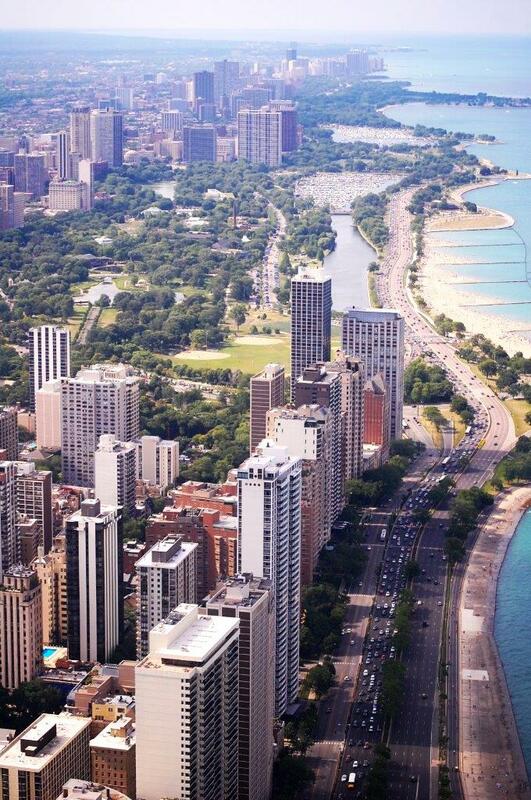 By plane Chicago has two airports, Chicago O’Hare (considered the 4th busiest airport in the world) and Chicago Midway. By train Amtrak trains arrive at the Union Station in downtown Chicago (more than 3 million passengers ride to and from the city each year). By car- Highway I-80 when arriving from East or West, I-94 when arriving from the North and I-55 when arriving from the South.